Change your hot tub setting to "economy mode". Fort Collins Utilities is replacing the 100-year-old cast iron 4-inch waterline beneath Mountain Avenue in two phases. Phase 1 impacted Mountain Avenue from Grant Avenue to Shields Street and was completed in August 2015. Phase 2 will take place from Shields Street to the cemetery and is postponed indefinitely. Waterlines are in both lanes of Mountain Avenue and each line will be replaced using trenchless technologies, such as pipe bursting and directional drilling. 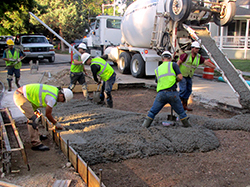 These technologies greatly reduce street excavation and associated costs. Neighborhoods in the Old Town area have aging infrastructure that contains the oldest 50 miles of waterlines in the city, many over 100 years old. This investment in a historic neighborhood will improve and upgrade infrastructure to increase fire protection and system reliability in the area. Waterlines exist in both the eastbound and westbound lanes of Mountain Avenue, resulting in basically two separate projects of approximately 2,000 feet of pipe on each side. In the westbound lane, the existing 4-inch cast iron waterline will be replaced with 4-inch PVC using trenchless technologies. To allow for greater fire protection in the neighborhood, the existing pipe in the eastbound lane will be replaced with 6-inch PVC. Trenchless technologies such as pipe bursting and directional drilling are sustainable practices that create minimal impacts to streets and surrounding landscaping and trees. From Grant Avenue or Loomis Street west to Shields Street, road closures and detours will be in effect for the duration of the project, although the Shields Street intersection will not be affected during this phase of the project. A temporary water supply will be in place for residents when the water services are disconnected from the old line. Periodic disruptions will be necessary and residents will be notified prior to shutoff. Approximately 65 water services will be reconnected to the new lines. In order to tie into existing services, some landscaping in parkways will be disrupted and will be restored. 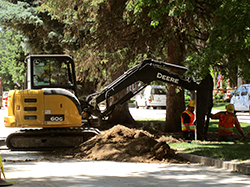 In late April to early May, the location and condition of sewer services will be inventoried to ensure they are not impacted during construction.